It seems like just about all of my friends are die-hard herb users, and because of this i‘m usually one of the first to learn about any new products hitting the market. Well, as it turns out for the past few weeks or so, I’ve been hearing a lot about a hot new vaporizer being released by the 7th Floor company. Now I know that may be a mouthful, but I’m just guessing that the “Da” in the products name is 7th Floor’s attempt at marketing to the younger “hippie” generation of herb users. If you ask me this was a pretty smart move as this segment of users tend to be very brand loyal, which is one of the reasons why products such as the iPhone by Apple tend to do so well when released. Click Here if you’re looking for the best deal on the Da Buddha vaporizer and you will be taken to Vapor Nation where you will get free shipping and some other free bonuses. How does the Da Buddha work? Using this vaporizer is very simple. Once you’ve plugged the unit in you simply turn the knob to your desired heating temperature. I must say that unlike a lot of other products the Da Buddha doesn’t have the standard numbers and temperature settings. This means that you’ll pretty much have to get some experience using the vaporizer in order to figure out what you like. I personally found that around the 1 o clock mark the vapor was nice and smooth just the way I like it. Once you’ve got your temperature set simply place your herb into the chamber which is actually located inside of the glass tube of the whip itself instead of the unit. Go ahead and plug this portion into the glass connector of the unit and then you’re ready to go. With the Da Buddha Vaporizer it really is that simple and easy to use which is why I think it would make an excellent vaporizer for someone just starting out. One thing I did want to mention though was the heating time. -Housing stays cool. With the Da Buddha you don’t need to worry about burning yourself as the encasing for the heating element is made separate from the outer casing. -Extra long cord. The power plug that comes with this vaporizer is about 10 foot long. This gives you plenty of space to use it just about anywhere in the room. -Durable housing. 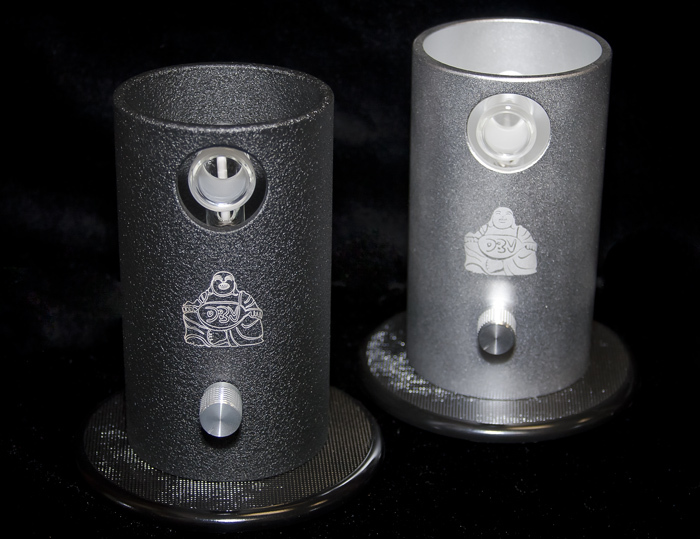 The Da Buddha vaporizer is made out of aluminum ho that is indestructible. That’s right, this thing is built to last! -Beautiful design. There’s a picture of a Buddha etched right on the front. This is the perfect vaporizer to top off a peaceful and serene setting. To make things even better is that once the heating element gets hot it starts to glow which makes the whole unit look like a candle. This is a beautiful effect when the lights are off! -No numbers on temperature control. Getting it “just right” is all a matter of experimenting to see which setting works best for you. -Comes in silver and black, but the black one costs a little more for some odd reason. What’s the best place to buy one of these? No doubt about it, the best place to get your hands on the Da Buddha vaporizer is from Vapor Nation. This merchant hands down offers the best deals on vaporizers and also the largest online selection. If you‘re in the market for the Da Buddha or any accessories then head on over and check them out! If there’s anything that I can say about the Da Buddha vaporizer it would be that it absolutely rocks! This thing has a very “mellow” and appealing look to it that just screams quality. When the ceramic heater gets hot and begins to glow the entire vaporizer actually looks like a candle that you’d see inside of a Buddhist temple. The vape that I was able to draw from the Da Buddha was thick and smooth which allowed me to taste every last bit of my medicines flavor. And to top it all off is the fact that this thing is a no brainer to use! I’m glad I got a chance to try this one out and if any of you are even thinking about getting one then I have to say that it is well worth the money.